Thank you to all the teachers and students of Arncliffe Public School, Manor Lakes Specialist College and Smithfield Public School who participated in the successful Term Trial. In particular I would like to thank Cathy Edwards, Tye Cattanach and Vincent Albanese whose valuable feedback has ensured this project will continue. When we build the setting for a story we are answering the questions when and where – the time, the place and the circumstances. The setting is the background for the events that take place but this does not mean it is unimportant. In fantasy stories the writers has to build the world. In historical fiction the writer has to research the time to make sure the facts in the story are correct. In real life stories the setting may be a place familiar to the writer. Even his/her own house! The setting can impact upon the characters. It can limit what they can do. Girls could not join the army of ancient Rome. This might suggest a story where a girl pretends she is a boy so she can join the Roman legion and travel all over the known world. A boy cannot climb a large mountain in a day. This might suggest super hero powers so he can fly to the top. Setting helps the reader visualise the story. The key to describing setting is the five senses – see, touch, hear, taste and smell. It is easy to describe what the character can see but a better description will also include some of the other five senses. 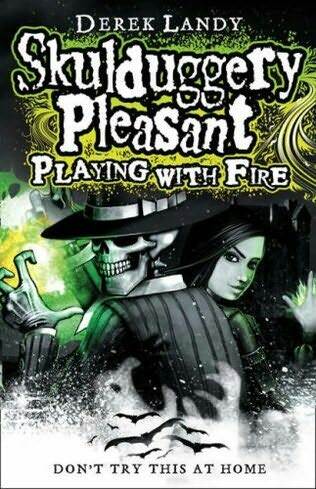 Here is the first paragraph from one of my favourite books Skulduggery Pleasant: Playing with Fire by Derek Landry. In this short paragraph we have see (the city), hear (laughter) and feel (brisk breeze, sense of height). The church tower stood high and proud, looking over Dublin City, The night breeze was brisk and carried snatches of laughter from the street below. It was a long way down. Choose one of the pictures below or find your own setting picture from a book or magazine. What can you feel? What can you taste? Write a four sentence description of using at least three of the senses above. What could you add to your description to tell the reader when? When could be the time of day, the time of year or the date? You could be direct. “It was a hot summer night” Or you could give a piece of information that provides the reader with clues. If you say “I heard an owl hoot” the reader knows it is night time. Dawn peeks over the edge of the mountain. Like leftover noodles, the village curls sleepy in the base of its soup bowl valley, while the first rays of sun snoop into its hidden huts. In this short paragraph we have see (physical scene), feel (sense of secrecy) and the time (early morning). Because this scene is in Korea, I have used images from Korean meals ‘like leftover noodles’ and ‘soup bowl valley’. While these images don’t tell us the place this give us a sense of geography –that this is probably somewhere in Asia. Manor Lakes Specialist College: 7. Is the Animal Story a Dead Duck? Word around the publishing industry is that animal stories don’t sell. My author friends advise me not to waste my time writing them – they are too hard to get published. But as a reader, I love animal stories - stories in which animals are the main characters. Animals are given human characteristics such as speech and any humans are the minor characters. 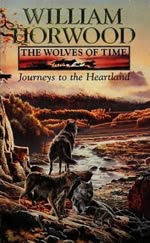 Two of my favourite series of books are about wolves (The Wolves of Time by William Horwood) and moles (Duncton Wood also by William Horwood). My all-time favourite book is about a mouse, The Tale of Despereaux. Apparently the movie was awful but the book is great. 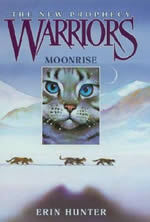 I also enjoyed the Redwall series (more mice), Watership Down (rabbits), Guardians of Ga’Hoole (owls) and Warriors (cats). Does anyone else have any animal stories to add to my list? Do you like animal stories and if not, why? Some readers say it is a ridiculous idea to have talking animals. Or that such stories are only for little kids. But to me it is no different than having a story with dragons and those are my most favourite stories of all. Although none of those has the dragon as the talking character. Perhaps I should write one of those! And if ever proof was needed that animal stories are not just for little kids, we only have to look at Animal Farm by George Orwell. Wrapped up in an animal story, this book is a social and political comment on corrupt leadership and how indifference, ignorance and greed can destroy a Utopian revolution. Time Magazine listed it as one of the 100 best English-language novels ever written. When I was researching this post I discovered a computer animated film of Guardians of Ga’Hoole is coming out on 30th September! It was produced in Australia and features the voices of a number of Australian actors and actresses. Smithfield: 4. You Can’t Judge a Book By Its Cover. Or Can You? Have you ever picked up a book just because the cover attracted your attention? I know I have. Lots of times. This is one of my favourites - The Eye of the Beast, the first book in the Moonshadow series by Australian author Simon Higgins. 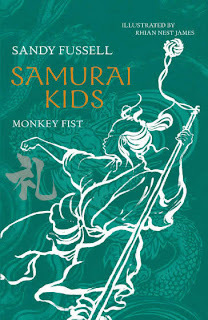 Set in feudal Japan, there's samurai, ninja and plenty of action. The style of the book cover is designed to catch the reader’s eye and most often this is the one feature that decides whether we pick up a book. A cover might encourage us to ask questions about the story. It might indicate the target age of the readers. It might also indicate the genre of the book. One look at the cover of Eye of the Beast and I immediately thought:- Japan, manga, sword and samurai. I couldn't tell from the cover whether it was historical or fantasy but I suspected a bit of both. The cover told me enough for me to know I wanted to read it. Don’t forget the back cover. There you might find a ‘blurb’ – a few lines or maybe a paragraph designed to tell you just enough to hook you into reading the story. There might also be endorsements from other writers who write similar novels. On the back cover of Andy Griffiths ‘Just’ series are quizzes to determine if the reader is just disgusting, just annoying or just shocking. There are awards for the best book covers. 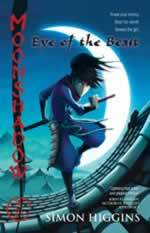 You can see the Australian Publishers Association Award winners for 2010 here. What do you think of the choices? Do you have a favourite book cover from a book you have read or seen in the library? Here is a YouTube on how book covers are made. 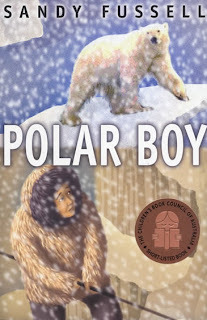 While the book is one for adults, it is interesting to see how the elements are carefully chosen to convey a particular message about the story. The first time I heard the word steampunk my interest was hooked. I love words, just for the sound they make, and steampunk immediately has an exotic, fantasy ring to it. Steampunk is a sub-genre of science fiction. 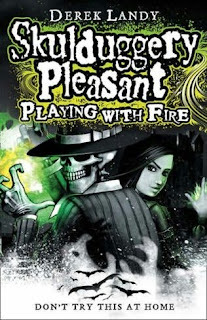 Stories are set in an era of spring gadgets, dirigibles, analog computers and steam power - often the 19th century Victorian era – and feature technology or futuristic innovations imagined by the people of the time. This technology of alternate history might include fictional machines or actual technological developments like the computer, but occurring at an earlier date. Here’s the best definition I could find (see right). The picture is a bit hard to read but you can see it in all its glorious artistic detail here. Historical steampunk is more science fiction than fantasy, but more recently the steampunk sub-genre has expanded to fantasy world settings that rely heavily on steam or spring-powered technology such as The Laws of Magic series by Australia author Michael Pryor (a favourite of mine). I did a bit of research and discovered steampunk first became popular in the 1980s and early 1990s. But the word is quite new to me; I only discovered it last year, which is probably an indicator of its current publicity profile. So what are the titles of some steampunk novels? Here are two lists to start with: Share Ranks Best Steampunk Novels and Steampunk 20 Core Titles . I looked through these lists to discover many of the titles were old friends. When I started Year 7 I was so overwhelmed by the huge high school library (compared to our tiny primary school room!) I didn’t know where to start. So I started at A. I found Aldriss and Asimov and read nothing but science fiction for many years. I didn’t know it then, but a lot of those titles were from the steampunk sub-genre. Steam punk is a great example of how a fiction genre can reach out into other areas – art, fashion and music. Here are some steampunk gadgets - just for fun! Thes eimages would also make great steampunk story starters. 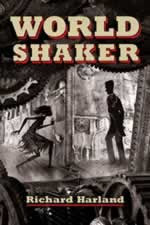 Boneshaker by Cherie Priest. (I haven’t read this on but when I saw the blurb I put it at the top of my list. Zombies, steam-powered technology, airships, pirates, and mad scientists—What more could you want? I also surveyed my Facebook friends who are always a treasure mine of information on books and they added Kenneth Oppel's Skyborn series, Phillip Reeve's Larklight (Michael Pryor's recommendation), Phillip Reeves' Mortal Engines series and James Roy's Icabod Hart & the Lighthouse Mystery (I haven't read this one but in my experience anything by James Roy is worth reading). 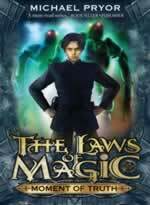 Check out Michael Pryor's YouTube Channel and the book trailer for Moment of Truth, the most recent book in the Laws of Magic series. It's no secret that I love words. I love making them up. Onomatopoeias are my favourite. I'm often making a lot of noise as I research sounds - banging my gong (that's Sensei in Samurai Kids!) and dropping rocks off my balcony (so I can hear the sound of Iluak tripping over the soapstone pots and pans in Polar Boy). The other thing I really like to do with words is twist them into something the reader might not be expecting. There are lots of common phrases we all know well. For example if I said "White as..." I would bet my next book at least half the class would say "snow". And if I quoted an idiom like "the cat that swallowed the ..." the other half of the class would say "canary". One way to improve your descriptions, and have some fun at the same time, is to always say the unexpected. And if possible, to relate the unexpected words you substitute, to the genre or tone of the book. 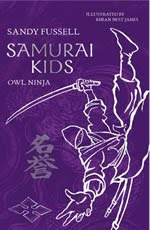 For example in Samurai Kids, when I was describing a sly smile, I used "the cat that swallowed the crane". I specifically didn't want to say canary (like everyone would be expecting) and I chose crane because it was not only a Japanese bird but the spirit symbol of my main character Niya Moto. Here are some common phrases for you to improve. And here are some idioms for a harder challenge. Don't forget to retain a sense of the meaning of the idiom. If I was writing a gothic horror story and the possibility of a character dying, I wouldn't say "I was afraid he might kick the bucket", I would say "I was afraid he might kick the coffin". Try and come up with truly unique twists. They might be genre relevant. Or really ridiculous and funny. Or beautifully descriptive. A favourite I remember from a workshop I did at the Sydney Writer's Festival was 'sparkle like a city of stars'. It's a really busy week for me, because it's Book Week. In three days I have spoken to almost 750 kids at 9 schools and visited 5 libraries. It is exciting, fun and exhausting. I have four more Book Weeking days to go. Did you have an author or illustrator visit for Book Week? Has anyone read any of the Book Week shortlisted books? 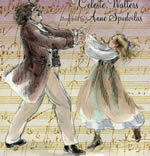 One of my favourite ones was Pearl Verses the World by Sally Murphy and it was selected as Younger Readers Honour Book. I am working on a special blog post for you about book covers - making a bit of a quiz so you can try to guess what is inside the cover. 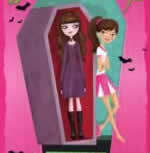 But it's taking me longer than I thought to find all the tricky covers, especially when I am visiting so many schools. So we'll do that one next week. I thought this week maybe you would like to ask me a few "Ask the Author" questions. I'll start off by telling you the question I have been asked the most in the last three days. Probably once at every school I visitted. So that must mean it is something lots of people want to know. And the answer is...drum roll... everywhere! 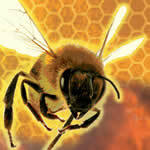 Ideas are like flies, they are buzzing around all over the place. The hard part, just like with flies, is knowing how to catch them. You catch them with questions! Who, what, where, when and why. Whenever you see, hear, smell, touch or taste something interesting, ask questions and you will find a story idea! On the weekend I went to the breadshop to buy a sausage roll for lunch and on the way out I saw someone had dropped a pie in the street. Splat. It was squashed flat! I started to think about what might have happened. Who dropped it? Why did it fall? I wondered whether some really hungry person had to go all day without anything to eat. Or maybe two kids were riding their bike down the pavement, pushing and mucking around until the pie fell out of the bike basket. Or... how did the pie feel? Maybe it was saying "I wish somene would tread on me and then I could travel all over the world on the bottom of a shoe." Sometimes I tell this story as an example - I do a great imitation pie voice. 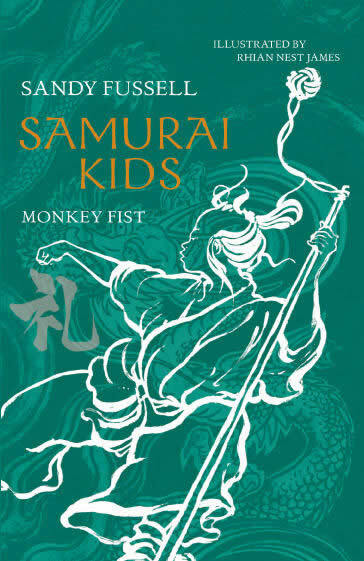 I got the idea for Samurai Kids when I read that to be a samurai, you had to be born into a samurai family. It's not like deciding to be a teacher or a doctor. You can't decide to be a samurai, not even if you are really good at sword fighting. So I started to think about kids who didn't want to fight but had to - because that was the job they were born to do. And then I thought: what if they weren't any good at it? What if they weren't any good at it because they only had one leg? That's when a sentence popped into my head: "My name is Niya Moto and I am the only one-legged samurai kid in Japan." Once I had that sentence I started to ask even more questions. What was Niya like? Who were his friends? 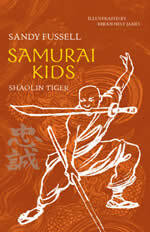 What did samurai kids learn? Who would want to teach Niya? What worried Niya about training to become a samurai warrior? Suddenly I had lots of story ideas. Enough for a whole book! So who has a different question they would like to ask me? I am a mum, a children's author and a computer programmer. Much to my surprise, the three go together very well. I love to read - anything and everything - but children's and young adult titles are my favourite. 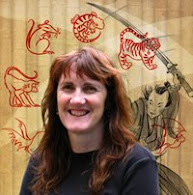 You can find me on the internet at my website, the Samurai Kids Website, my blog Stories Are Light, the Samurai Kids forum,(see right) or here! Copyright 2009 - ReadWrite Zone. Powered by Blogger.